As we know the fishing at times reflects some of the weather conditions we get. This week we continued to get average (74F) temps or below which is very pleasant however we did get several severe thunderstorms with some guests getting caught in golf ball size hail. Hence we should all respect forecasts before taking to the water. These storms seemed to have a positive fishing affect as we had over 30 Muskie caught during the week. Reed Thacker & Todd Cambron from Indianola, IA returned for their 3rd consecutive year. 1st day was tremendous & by 1:00PM stopped counting the Northern Pike they caught at 40, plus Reed caught 3-19” Trophy Smallmouth. 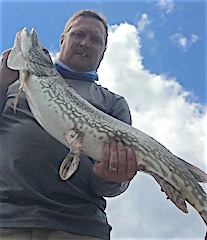 2nd day was a great BIG fish day as they caught a number of large Pike & Todd was hot again catching a Trophy 19” Smallmouth, a 38 & 41” Tiger Muskie. Their voices were full of excitement when telling the days fish stories in the lodge. 3rd & final day they focused on Muskie but severe T-Storms took them off the water early & were not able to return. Both had a great stay & said they would see us next year. Long time guest from Grand Blanc, MI Greg Benton was back introducing friend Steve Barron from Lennon, MI to Canada fishing for his 1st time. 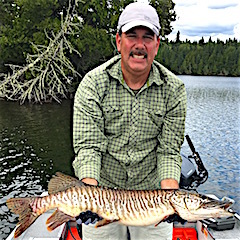 It is all about Muskie with Greg and on the 1st day Steve found a pattern where he fish were near areas where hard bottom meets soft, had a bunch of Muskie follows catching a few Muskie & some nice Pike. 2nd day was very good catching a lot of nice Pike having some big Muskie follows plus they found a new underwater hump that was holding some good size toothy critters. 3rd day they discovered another underwater structure holding a lot of fish. 4th day they caught a few fish but T-Storms kept them from fishing most of the day. 5th & final day was a terrific day fishing & Steve caught the Northern Pike of his life landing a GIANT Trophy Northern Pike with using fishing techniques Greg has developed over his long tenure fishing at Fireside Lodge. Both left all smiles & as Greg was walking out of the lodge door he turned and said, the countdown has already begun until next years return. John Bahls with his 3 sons Dave, Rob, & Don from Hastings & St Paul, MN were fishing with us for their 1st time. Muskie seemed to be their prime target on the 1st day getting a number of follows. 2nd day Rob & Dave were back at the Muskie getting plenty of follows, Dave landing 2 and they caught some Pike. John & Don caught a few Smallmouth Bass then got into a bunch of nice Northern Pike. 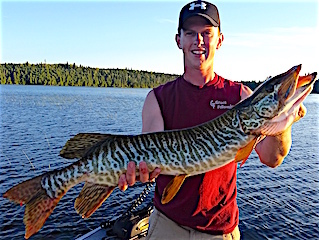 3rd day was great as Dave & Rob Muskie fishing had the most follows ever & Dave landed a beauty Muskie measuring 38”. John & Don went for quantity catching 40+ Northern Pike. 4th & final day John & Don were onto the Pike again while Rob & Dave were Muskie Hunting with Rob cashing in on 2 nice Tiger Muskie measuring 32 & 34-inches. All had a great time and said they will be coming back in August next year when the BIG Fish hit larger lures near the surface. The Ramsey Family was returning for their 5th time including Father / Daughter Mike & Cathy from Penn Valley & Sacramento, CA Butch & Will from Hillsboro, OH & Dan from Germantown, OH. 1st day on the water this crew tore it up catching over 151 Northern Pike, 10 Smallmouth Bass with Will landing 2-trophy size at 19 & 18”. 2nd day was tougher trying to battle severe T-Storms, which they got caught in withstanding golf ball size hail, but still caught some great fish. 3rd day was terrific getting countless follows on Muskie & landing 10 Muskie in one day, Cathy catching her 1st ever & 2nd Muskie. They also caught 30+ Smallmouth Bass including 7 trophies between 18-20”. 4th day was about BIG Numbers as a group catching over 140 Northern Pike & Will landed a nice 34” Tiger Muskie. 5th & final day was searching for Muskie. 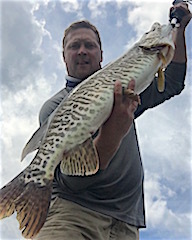 They had a terrific day landing 4 between 28-33” but Mike caught the prize fish of the week landing a 42” Muskie with a huge girth on a lure everyone was making fun of, The Swimming Rat. They also caught some nice Smallmouth Bass & Northern Pike. All left having a fantastic family fishing vacation and made reservation for an expanded group of 10 in 2017. Mike & Janet Estes from Livonia, MI returned for their 4th time. DOA they caught 8 Pike and while Janet was fighting a Pike a HUGE Muskie took a swipe at her fish nearly cutting the tail off. 1st day they started in their favorite spot with success and caught some nice Northern Pike & Mike finished the 1st day with a nice 34” Pike. Also, they found a BIG Muskie that followed Janet’s lure twice for two days. Next day they caught more Pike Janet having that BIG Muskie visit her again plus she caught a Trophy 18.5” Smallmouth Bass. 3rd day was a great Smallmouth Bass day catching over 30, plus several Pike. 4th day was another great day catching 31 Northern Pike with lots of expression “PIKE”. 5th day Janet had an experience like never before catching her first ever Muskie. It fought so hard for so long all the way to the boat but she still managed to land it and get a great picture. 6th & final day it was Mike’s turn as he caught his 1st ever Muskie being the same size as Janet’s the day before. Both really enjoyed their stay fishing and visiting with others & made their 2017 reservation before leaving. The Gillfilan family, Marvin, Deb, & Kristi from Cincinnati, OH returned for their 2nd time. 1st day they went out and had some good Northern Pike fishing enjoying a beautiful day. 2nd day was spent targeting Smallmouth Bass which were scattered, but they caught fish and had fun. 3rd day was full of T-Storms keeping them of the water for a major part if the day but did manage to catch some Pike & Smallmouth Bass. 4th & final day they had a great Family Fishing time together catching fish, having laughs, & making memories, which is the biggest catch of all. The Wilson family Father Bill, sons Craig, & Jeff with Paul Manley were fishing with us for their 1st time. DOA they did well catching Pike & Smallmouth. 1st day was an exercise in learning the waters, which came natural, and they caught fish, mostly Pike & Paul caught a 3.8lb Smallmouth. 2nd day they found fish, catching some along with having many follows, however they were hampered by a day of T-Storms. 3rd & 4th days they caught some nice size Northern Pike up to the mid 30” range. 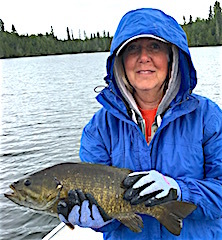 5th day was great fishing finding a honey hole catching many BIG Smallmouth Bass, Bill & Jeff catching trophies at 18 & 19-inches, plus they caught a lot of Northern Pike, with 11 being 30” or better. 6th & final day was similar to day 5 catching many quality fish, both Smallmouth Bass & Northern Pike. All left having a wonderful traditional family fishing adventure and parting words were, we will see you next year. Father & son Russ & Rusty Rapp from Bourbon, MO were happy to be fishing with us for their 1st time. 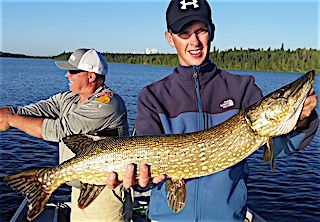 1st day ever on our water was fabulous Northern Pike fishing as they caught over 40 fish. 2nd day they caught a mix of Smallmouth & Northern Pike & Rusty caught a Trophy 18” Smallmouth Bass. 3rd day they again had a good day catching a mix of Smallmouth Bass & Northern Pike. 4th & final day they finished strong catching near 50 Northern Pike. Both left enjoying their stay & meeting some new Fireside Friends. Pure Fly-Fishers Steve Jensen from Springfield, MO returning for his 14th consecutive year came with Ralph Eichholz from Ozark, MO for his 2nd time. 1st day was tough fighting winds & several T-Storms, but they managed to catch some Pike & Smallies. 2nd day they again did well catching Pike & Smallmouth. 3rd day was super catching many Pike, 40-50, & Steve caught a MONSTER Trophy Smallmouth Bass at 19”. 4th day was a near repeat of the 3rd. 5th day came with lite rain all day, catching Smallmouth & Northern Pike. Both had a great stay & made 2017 reservation for a group of 4 before departing. Long time guests Bill & Rosanna Goodwin from Wilmington, DE were glad to be back to target Smallmouth Bass. 1st day they caught 25 Smallmouth Bass up to 16”. 2nd day they caught about the same as the 1st but some bigger Smallmouth in the 16” range. 3rd day was very good catching 29 Smallmouth Bass up to 17” plus several nice Pike. 4th day was a relaxing day spent exploring new sections of the lake they rarely or never fished before and picked up some nice Northern Pike. 5th day was spent catching Smallmouth Bass with an interruption when Rosanna seemingly was stuck. Bill took her rod to help only to discover she had a huge fish on. After a long fight this very large fish ended up throwing the hook. 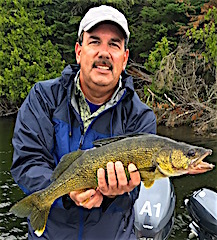 6th & final day was a 20 Smallmouth bass day including a Pike & 33” Muskie plus they lost another BIG Muskie at the boat. Next year they are planning to bring more of their family as they have done in the past. Scott & Zach Zimmerman from Kingsport, TN were visiting us for their 1st time. 1st & 2nd day they caught some Smallmouth Bass & Northern Pike while learning the lake. 3rd day was GREAT catching 31 Northern Pike & having many more on and lost. 4th & final day was another very good Northern Pike day catching over 25 fish ending on a high note. Before departing Scott said he would contact us soon about 2017 reservations. Bill & Jill Westbrook from New Philadelphia, OH returned for their 14th consecutive year. 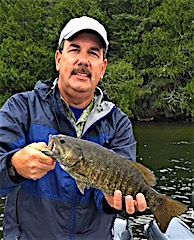 1st day the did great catching over 30 Smallmouth Bass each landing a Trophy Smallmouth Bass 18 & 18.5”. 2nd day they caught 25 Smallmouth Bass each landing another 18” Trophy, plus Bill caught a 38” Tiger Muskie. 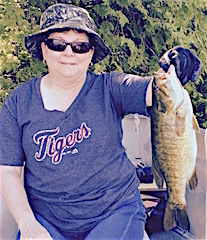 3rd day was another good day catching Smallmouth Bass with Jill catching a 19” Trophy & Bill had 2 more at 18”. 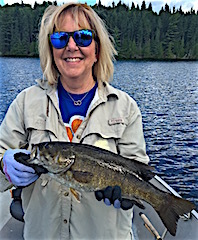 4th day was another excellent Smallmouth Bass day catching over 25 including 3 more trophies at 18”, Jill with 1 and Bill with 2. 5th & final day the caught 30+ Smallmouth Bass up to 17.5”. They also had a great time having Lodge conversation & lots of laughs with other guests and have all intentions on returning in 2017. Mike Skowronski from NJ returned for the 2nd time this year. 1st day he had a good day catching Pike from 27 to 34” and a nice Muskie. 2nd day he caught 2 nice Tiger Muskie and a Bunch of Northern Pike many over 30” up to 34”. Some of these fish were caught in traditional areas casting, however some were caught 8-12 feet down over open water amongst schools of baitfish. 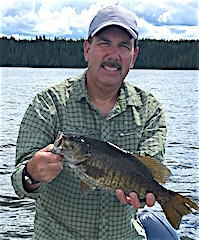 Mike also managed to land an 18.5” Smallmouth Bass. 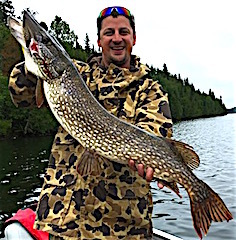 3rd & final day Mike was another good day Northern Pike fishing topping off his second trip with us in 4 within 3 weeks and he hopes to return in 2017.